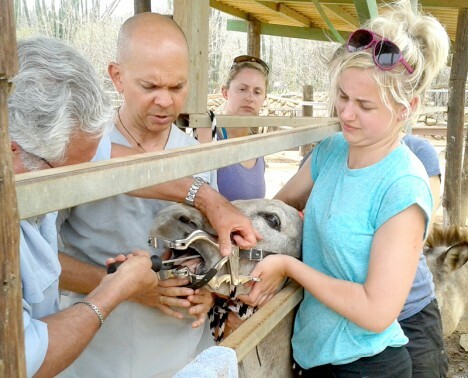 Trainees will have the opportunity to undertake activites in the Aruban Donkey Sanctuary (mornings or afternoons) and supplement these activities at Philips Exotic Animal Garden, where they will be involved in hands on care for both recovering and healthy animals, birds and reptiles. Trainees can spend time in a local vet surgery observing and supporting the vetinary staff. Depending on the season of the activity trainees may have chance to be involved with turtle conservation work or bat monitoring in the national park. You could also take part in a dog grooming project. Aruba is a 33 km-long island of the Lesser Antilles in the southern Caribbean Sea, located 27 km north of the coast of Venezuela and 130 km (approx.) east of Colombia. Aruba is one of the four constituent countries that form the Kingdom of the Netherlands, together with the Netherlands, Curaçao, and Sint Maarten whose citizens share a single nationality: Dutch citizen.The sanctuary is near Santa Cruz, a beautiful tourist city.